I've been trying to use up some shortening I have in my pantry by baking cookies and biscuits. I don't have pictures of the biscuits (if you want biscuits go to Bob Evans!) but here are some peanut butter cookies. These cookies are basically the Jif recipe, but I used natural peanut butter, dark brown sugar and a few other tweaks. I just can't leave well enough alone. And here's a picture of the almond torte I made for "A Star is Born" themed baby shower. I was so excited to use the star-shaped pan I found while shopping for party favors. 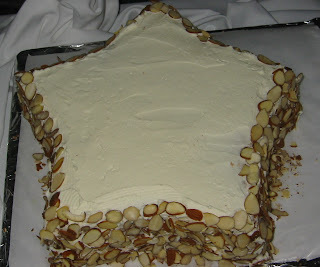 It's frosted with whipped cream frosting and the sides are covered with slivered almonds. I won't be baking much for Thanksgiving since the pies and a second dessert are covered. I'm making some pumpkin bread and maybe some more cookies to use up the BFC.